My dining companions don’t believe me when I tell them I don’t care about celebrity chefs. I keep track of their comings and goings of course. But when it comes down to making restaurant recommendations, their personalities take a back seat to their cooking. One celebrity chef I had never heard of before was Judy Joo, the mind behind Jinjuu on Soho’s Kingly Street. She’s apparently a veteran of both Gordon Ramsay’s tutelage and the Iron Chef TV shows. Even though there’s no shortage of Korean restaurants in London with notable concentrations in Soho and New Malden (the odd cluster around Centre Point is now a thing of the past sadly), Korean food barely registers on most Londoners’ radar. Jinjuu aims to change that with a relatively short menu of classics joined by a couple of more inventive dishes. I kicked off my first visit to Jinjuu by sharing a bowl of mussels with Snaggletooth. 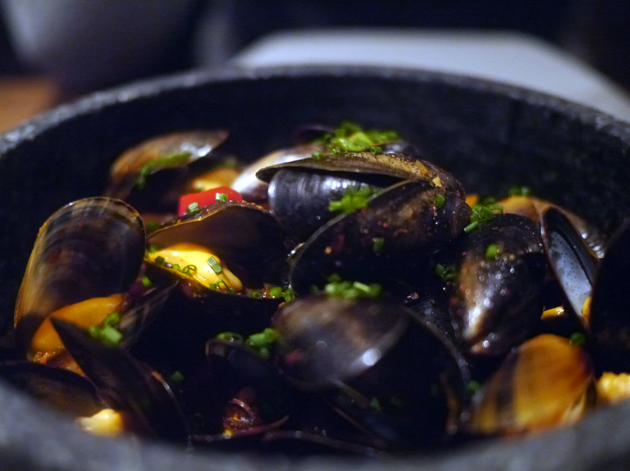 While the small mussels themselves were unremarkable, the sauce they were served in was a different matter entirely. Apparently made from a pair of traditional Korean fermented soybean sauces, it was a thin but sour, tangy and salty concoction dotted with fatty, chewy bits of bacon. We scooped up every last drop. 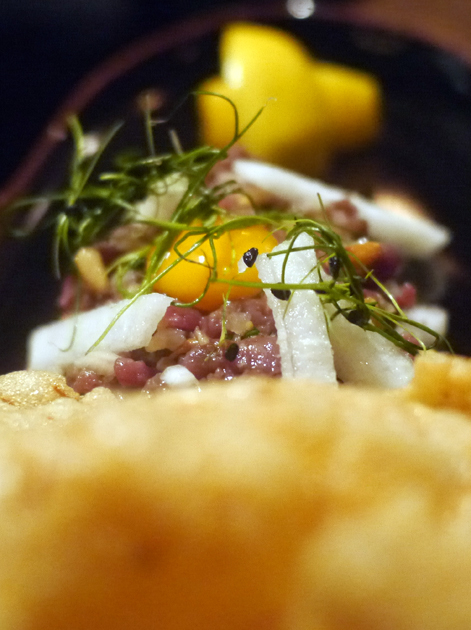 The yuk hoe, a Korean counterpart to steak tartare, isn’t served partially frozen as it is elsewhere and is therefore more palatable to Western tastes. While tender, the beef used was lacking in character. The julienned pears weren’t as sharp, crisp and sweet as I was expecting, while the egg was lacking in richness and there wasn’t much seasoning either. It was frankly bland and uninteresting. Served with prawn crackers for use as make-shift spoons. For some reason. The jap chae was also a damp squib. Satisfactorily stir-fried glass noodles were topped with tender but bland slices of beef and a grab-bag assortment of uninteresting vegetables. 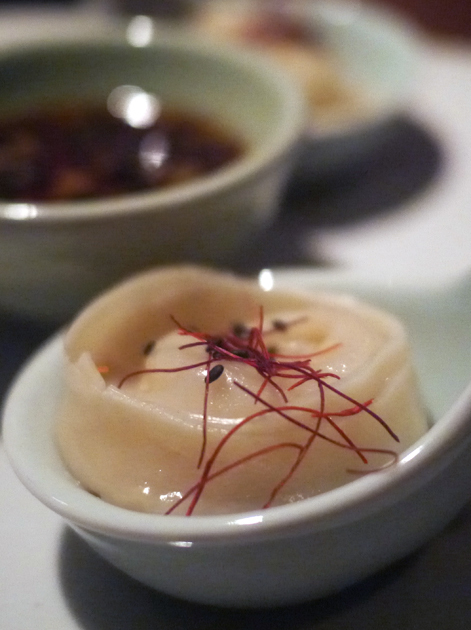 Much more pleasing were the mandoo dumplings. The supple and moderately thick skins contained a hunk of beef and pork flavoured with a hint of ginger which was accentuated by the lightly spiced dipping vinegar served on the side. The only disappointment here was the small-ish portion of just three dumplings, but they were at least big chuffers. Oddly served on spoons too big for your gob. Or at least too big for my gob. Barbecued beef kalbi is served with some lettuce and nori on the side – the idea is that you use the veg as a wrapper for the meat, transporting it into your waiting maw. The moo flesh here wasn’t especially characterful but it was tender, a little chewy and cooked medium rare. Far better was the accompaniment of kimchi served on the side. From carefully cut slices of cabbage to thin slithers of daikon radish, all the kimchi were pleasingly tart, sour and lightly spicy. Snaggletooth’s dessert of a surprisingly chewy doughnut filled with a lightly salted caramel was far better than I expected it to be. It was even more scrumptious when taken with the evocatively nutty peanut butter ice cream and the reasonably bittersweet chocolate ganache. My own dessert, a deconstructed parfait, was less successful. 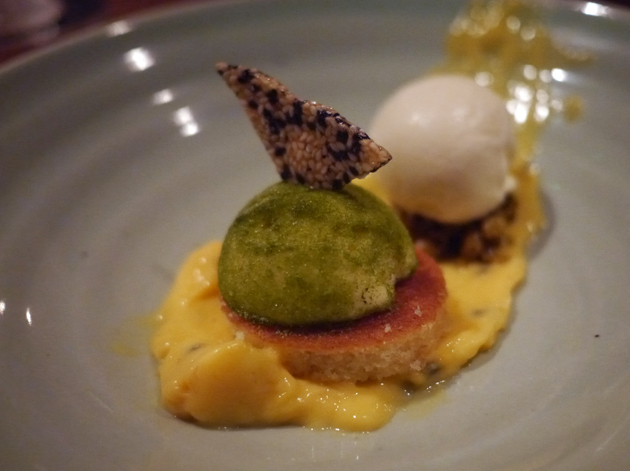 The creamy and tart yuzu custard was a real pleasure, but the uninspiring mini cake and bland ice creams left me cold. When the powerfully nutty sesame seed wafer overshadows both the cake and the ice creams, then something has gone very wrong. 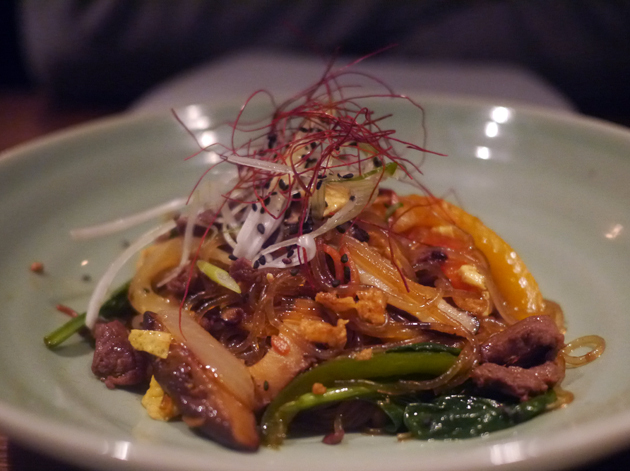 Oddly, many of Jinjuu’s non-traditional dishes are only listed on the menu for the upstairs bar. You can ask for them when seated downstairs in the restaurant proper, although you wouldn’t be missing much if you skipped them. The mini bulogogi beef burgers used meaty, tender patties with a slight sourness and tang to them. They’re not bad, but both Kimchi Cult (now sadly relocating to Glasgow) and Hawksmoor Seven Dials do far better Korean-inspired burgers. Plus £7 for two bite-sized morsels is just bare-faced cheek. ‘Sliders’ is a TV show from the 1990s, not a needless term for overpriced mini burgers. Wheat flour tortillas were used for the generously stuffed pork belly tacos. 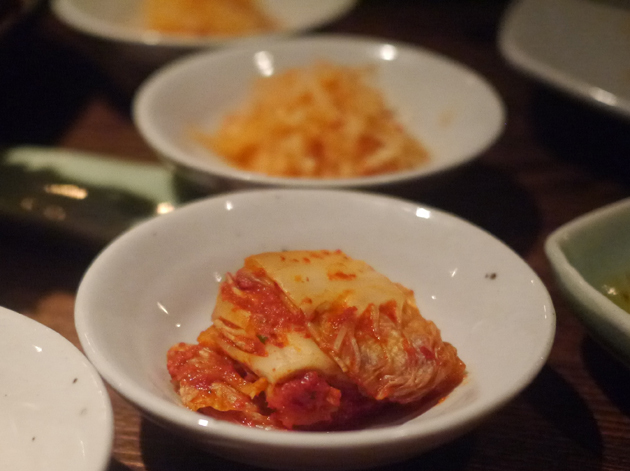 The ginger-flecked pig pieces weren’t fatty enough though, leaving it to the punchy kimchi to pick up the slack. 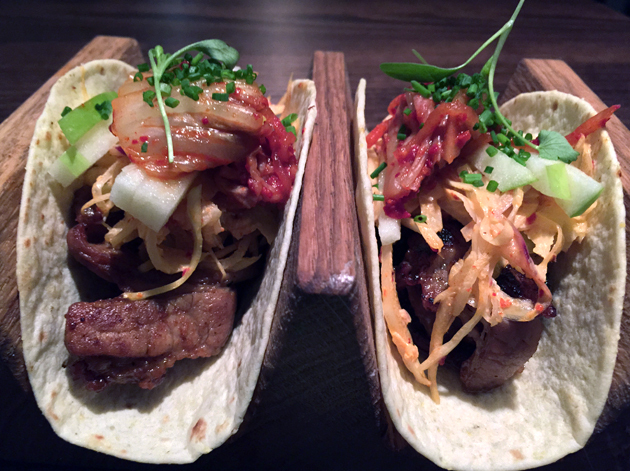 They’re better value than the wee burgers, but they’re upstaged by Korean-inspired tacos from street food stands such as Kimchinary. You won’t get these in New Malden. High street fried chicken is the dirtiest and mankiest of all the fast foods, but London’s restaurants have been making valiant efforts to rehabilitate it over the past few years. Jinjuu’s version has allegedly been fried twice for extra crispiness. While the whole thigh here was indeed crispier than usual, the difference was hardly dramatic. It was a bit too oily for my liking, but at least it wasn’t bad enough to coat my chin in effervescent slick. More problematic were the tame sauces served on the side in little squeezy bottles. The soy sauce failed to stand out against the oily crunch of the batter, while the thin fermented bean paste needed to be applied in Biblical quantities before its spicy heat became noticeable. In a word: meh. Apparently this is Jinjuu’s signature dish. Hmm. 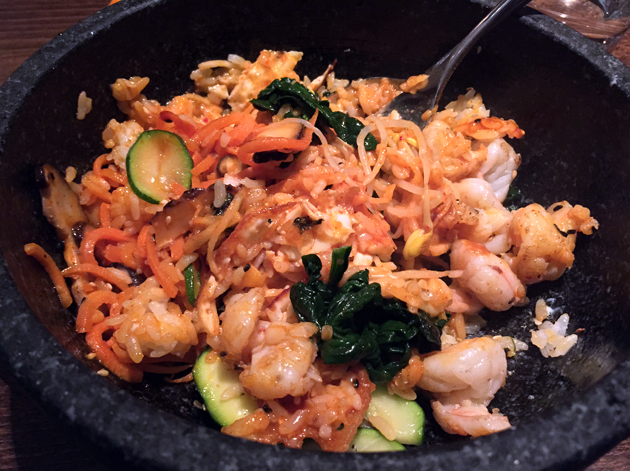 The prawn bibimbap was far better. The selection of vegetables mixed into the rice wasn’t very exotic, but the bitter spinach, crisp mung beans and mildly buttery courgettes meshed well with the fried egg and spicy, nutty fermented bean paste. The prawns were small, but reasonably fresh and punchy and didn’t detract from the pleasing homeliness of this dish. This review was brought to you, in part, by The Hives. 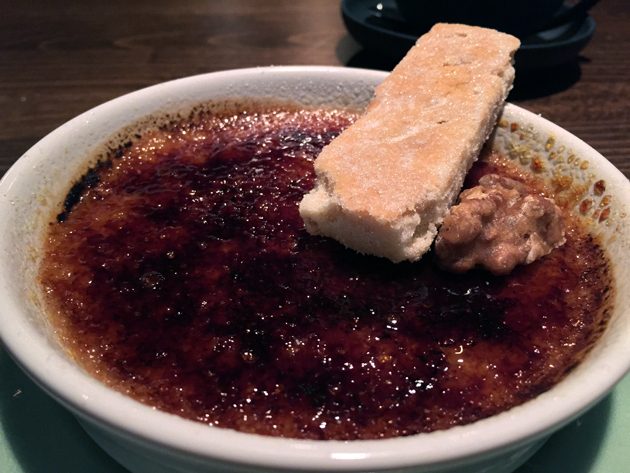 The sugary crust of the walnut and miso creme brûlée was almost too crunchy and sweet, nearly sticking to my teeth as I crunched my way through it. 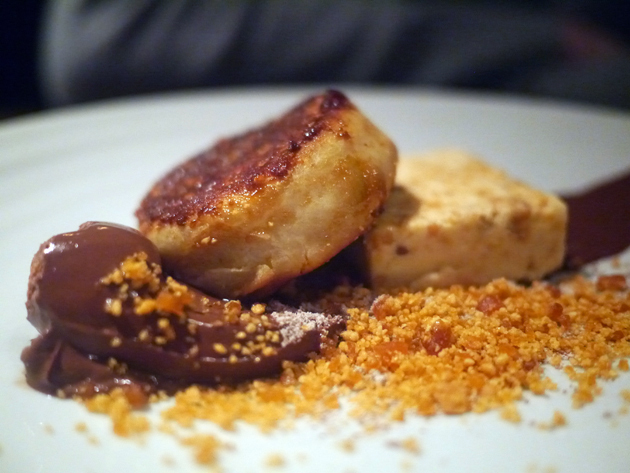 The odd walnut and miso cream underneath tasted somewhat like caramelised bananas. It was pleasing enough, but far more nuttiness came from the candied walnut half. The pine nut shortbread was evocatively flavoured, but it tended to overpower the rest of the dessert. An odd, disjointed effort. I’ll have to try my hand at pine nut shortbread. 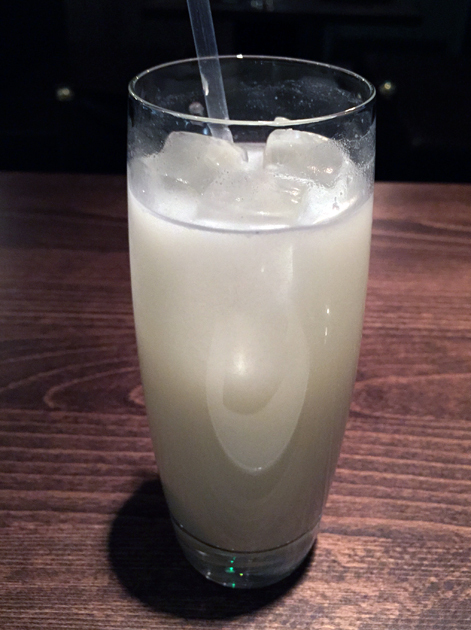 As non-alcoholic Korean rice punch isn’t available, I settled for the pear punch which tasted much more like pineapple. 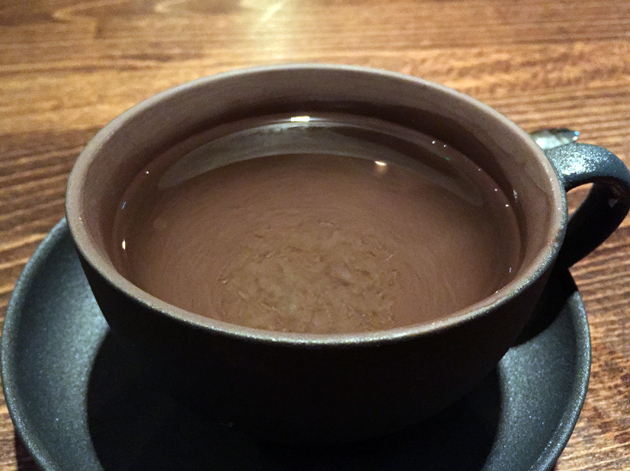 The aloe vera tea unsurprisingly tasted like warmed up aloe vera juice, but the greatest concentration of taste lay in the fleshy bits at the bottom of the cup with the rest of the drink treading water. Pineapple posing as pear punch pic. 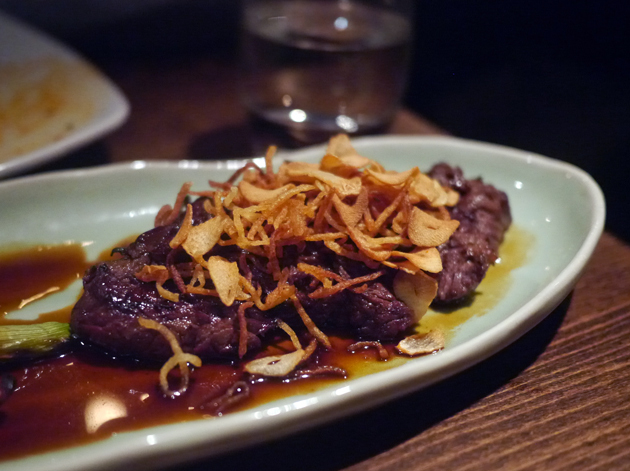 Although Jinjuu has only been open for a few weeks at the time of writing, it’s already immensely popular with dinner reservations hard to come by. Its popularity is frankly inexplicable – there are a few good dishes here, but they are outnumbered by many more mediocre ones. The bandwagon-ish fried chicken, burgers and tacos may entice reticent neophytes into dabbling further with Korean food, but something has gone awry when they’re outclassed by the competition which includes street food stalls. Unless peeling yourself away from Soho is too traumatic or you’re easily impressed, you can do better elsewhere. Opening Hours: Monday-Saturday noon-15.00 and 18.00-midnight. Sunday noon-16.00. Average cost for one person including soft drinks: £47-55 approx. Tags: beef, bibimbap, burger, creme brulee, doughnut, dumplings, fried chicken, gochuang, jinjuu, kimchee, kimchi, london, mussels, noodles, parfait, prawns, restaurant, review, ssam, steak tartare, taco, yuk hoe. Bookmark the permalink. Fried chicken is commonly associated with “delicious”, “sinful”, “satisfying”, “glorious”. However the fried chicken at Junjuu resonnated with none of these. In fact, I was faced with a pile of greasy and bland chicken served with two sauces that tasted artificial and were revolting. Yes it is true that “Korean food barely registers on most Londoners’ radar” but it certainly does not mean that Londoners’ palates are not sophisticated enough to distinguish between good and bad. 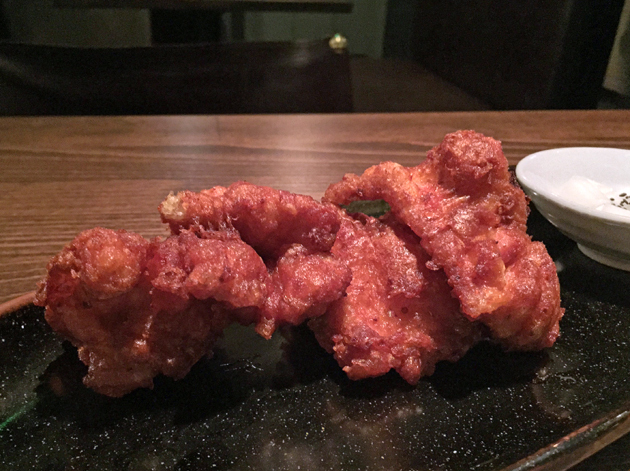 Jinjuu would certainly not survive in New York where Korean fried chicken of much superior quality can be purchased for $15-20.